The 4-banger is dead. | The Solar Nerd. My prediction: by 2022 there will be an inexpensive electric car on the market that will travel 500 miles per charge. When this happens the traditional 4 cylinder commuter car will slowly go extinct. The 2017 Chevy Bolt pictured above is one of the first fully electric cars in the $30,000 price range with over 230 miles in full electric range. There have been other electric cars on the market like the Nissan Leaf, but the 100 mile range on the Leaf is too limited for buyers who have a longer daily commute. I drive a 2013 Chevy Volt, which has 38 miles of electric range before a gas generator kicks in to power the drive motor. I’m still getting over 100 miles per gallon on days when I drive less than 45 miles. My Volt is FOUR TIMES more efficient than the Toyota Avalon it replaced. In electric mode my Volt is smoother, quieter and MUCH faster than any 4 cylinder car I’ve ever driven. Driving an electric car is similar to driving a very refined Lexus V-6, if Lexus was able to totally eliminate engine noise. Occasionally I have to drive my daughter’s 4 cylinder Honda Accord, the Accord feels like a dinosaur of old technology compared to my Volt. An electric car with a 500 mile range, priced like a Civic or a Corolla, will dominate the commuter car market. 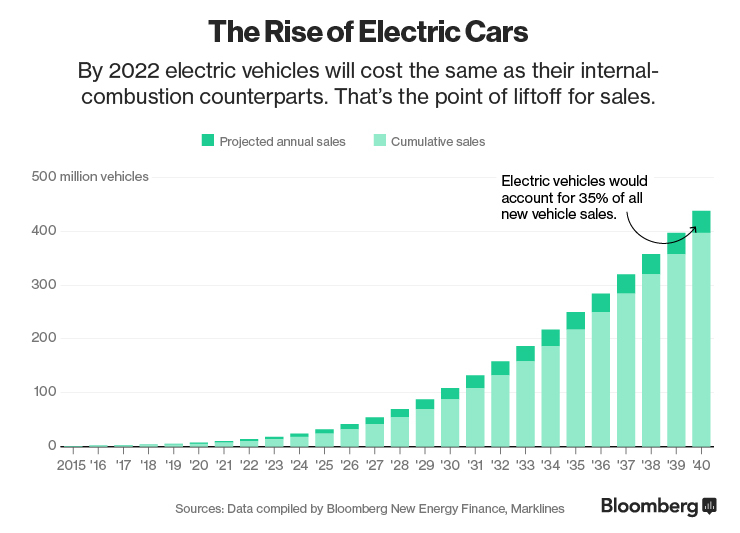 In 2 car households they might keep the SUV or the minivan as the 2nd vehicle, but the spouse with the longer commute will love the improved driving dynamic and low fuel costs of the 2022 electric car. It costs about $30 per month to charge your electric car at home, even cheaper if that homeowner installs a small solar array on the roof. Gas stations will slowly go out of business, so will national chains like Jiffy Lube. No need for an oil change in a car with an electric motor. Electric cars require much less maintenance, and last far longer. Gas powered cars are crammed with complex parts; radiators, exhaust systems, oil pumps and alternators fail on a regular basis. Electric cars don’t need any of these components. There are no drive belts that need to be replaced… and less brake wear because regen brakes slow the car more than the brake pads. Even if gasoline stays below $3 per gallon it can’t compete with cheap electric rates, which are the equivalent of about 40 CENTS per gallon. Once we have electric cars that can go 400 or 500 miles per charge it will seem silly to buy a noisy and expensive gas powered vehicle. If the electric company decides to jack up electric rates the consumer can install solar to offset the increase. Your roof will replace your gas station.